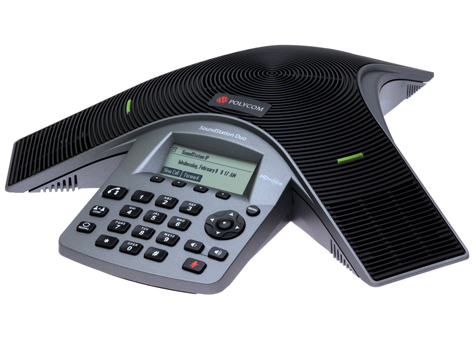 Polycom SoundStation Duo Conference Phone – Both Analog and IP – GREAT Investment Protection! The Polycom SoundStation Duo conference phone is a dual-mode analog/IP conferencing telephone provides exceptional deployment flexibility and best-in-class investment protection. Designed for small to midsize rooms, SoundStation Duo is easy to set up and use. And, it delivers Polycom’s legendary audio performance. In VoIP environments, the SoundStation Duo conference phone delivers the most robust, standards-based interoperability in the industry. This entry was posted in analog, Analog conference phone, audio, audio conferencing unit, conference phone, conferencing unit, ip, IP conference phone, polycom, soundstation, soundstation duo, telephone, voice on October 14, 2012 by jjackson.